Bob Bailey never commanded much of my attention when I was a kid. To be honest, I don’t even remember him coming to bat for the Red Sox as a pinch-hitter during the 1978 one-game playoff against the Yankees, which in general was the most memorable game of my childhood. In that awkward, wounded, sprawling decade, Bob Bailey quietly blended into the background. Once he disappeared entirely from view I began to confuse him with Bob Bailor, who flickered to marginal life in the majors just as Bob Bailey was fading. I understand now that utility infielder Bailor was nothing like underrated masher Bailey, who for several years held many of the Montreal Expos all-time slugging records. 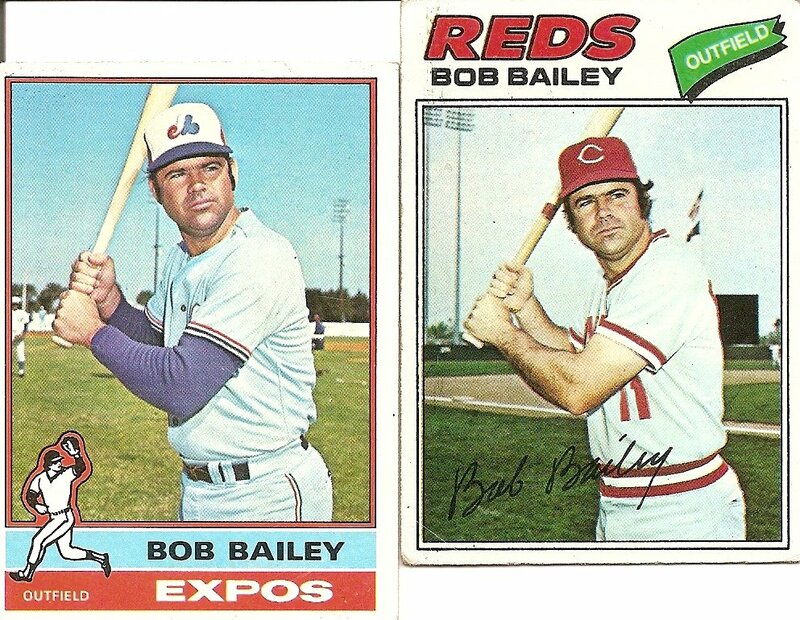 But as the above duo of cards reflects, even the Expos were capable of underestimating Bob Bailey, shipping him to the Reds for Clay Kirby, who in the season prior to the trade, despite pitching in front of four Gold Glove winners, posted a 4.72 ERA, over a run higher than the league average. Of course, the above duo of cards also suggests that Bailey let nothing, not even a complete change of scenery, affect his approach to the game. Let the rest of the world stumble and panic. Let the rest of the world try out new styles to cope with profound transience, with the widespread crumbling of societal norms. Let the rest of the world grow long hair and beards and mustaches and attend EST meetings and quit their jobs to sell homemade hammocks and get divorced and meditate and learn the Hustle. Bob Bailey is going to keep being Bob Bailey. He is going to stand there, implacable, and wait for his pitch. Fittingly, Bailey did his usual thing for the Reds (.298 batting average/.376 on-base percentage/.508 slugging average), albeit in limited duty (227 at-bats), but did not play in the postseason. The Reds shuttled him to the Red Sox near the end of the next season, and the following year he was sent to the plate to bat for Jack Brohamer in the seventh inning of the one-game playoff game against the Yankees. His last career at-bat, as it turned out. He was the potential tying run. Goose Gossage was on the mound. It was a big moment, but he surely stood in the batter’s box the same as he always had. Waiting for his pitch. Waiting for his moment. Three pitches later he was walking back to the dugout. I have a card for him on the Red Sox that year, and he seems in that card too old to still be waiting for his pitch. But I’m older now than he was then and I’m still waiting for my pitch. Waiting for my moment. You are currently browsing the archives for the Bob Bailey (Mon.) category.